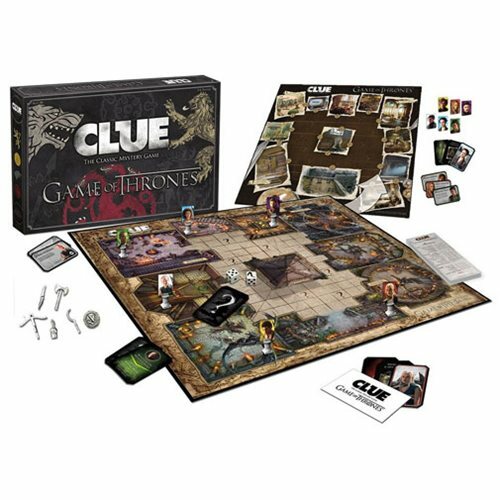 High treachery and betrayal are behind the two mysteries to solve in Game of Thrones Clue! Featuring a double-sided game board, players choose to solve the murder mystery in The Red Keep or in Meereen. WHO was responsible for plotting the murder? WHAT weapon was used and WHERE did the crime take place? Comes with 12 suspects, including Cersei, Jamie, and Tyrion Lannister, Sansa Stark, Petyr "Littlefinger" Baelish, Margaery Tyrell, Daenerys Targaryen, Hizdahr Zo Loraz, Missandei, Daario Naharis, Jorah Mormont, and Grey Worm; along with 6 custom metal weapons, including poison vial, battle axe, arakh, faceless man, crossbow, and catspaw assassin dagger; plus 21 Intrigue Cards, including 13 Master of Whisperers and 8 White Walkers! For 2-6 players. Ages 18 and up. Whodunit? Find Out Now with Game of Thrones and Harry Potter Editions of Clue!